Korean Foundation published their own book for 17,000 won. 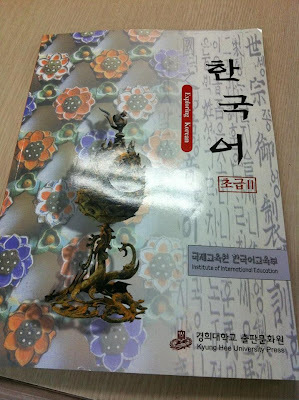 3- Saturday near Sookmyung University -4.30pm to 5.00pm - intermediate (Kongbubang). Just pay 1,000 won after each class for the material fee. My semester with Sogang University will be ending on 17th February and I have about a week to spend with my friends before everyone going to their respective home country. Some of them will continue with Sogang University, some like me will continue with FREE classes and some will take the night class due to job commitment during the day. So far I love the energetic teachers at Seoul Global Center (SGC) and Korea Foundation. While SGC is only a review class for me but Korea Foundation's is pretty much intensive and I hope I could keep up with the speed. I love both teachers because surprisingly both of them have so much drive! That is the only the FREE part. Sightseeing, shopping and entertainment would need more $$$. regular kimbap starts from 1,500won at Kimbap Nara or Chonguk. So if you want to stay in Korea with a tourist visa for a year to get the FREE Korean lesson, how much money should you save? What about getting a scholarship? I'm thinking about it..but I'm too lazy though to study all over again. I just want to study things that I'm interested in ie. Korean language and study the culture by travelling and interacting with Korean. 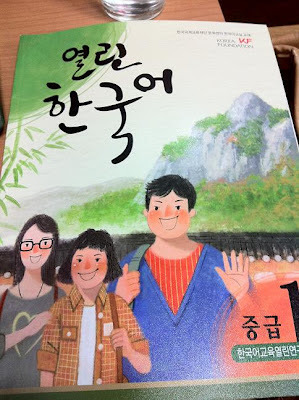 How to be fluent in Korean Language faster?